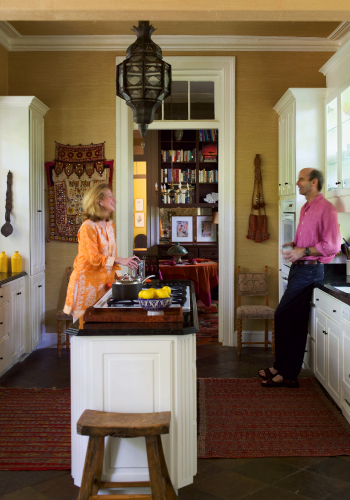 "We knew this was the house for us as soon as we walked through the front door. 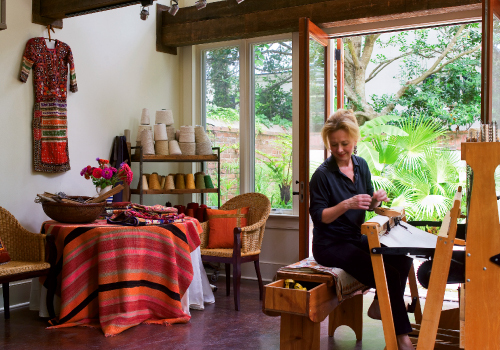 It just felt right,” says Susan, a textile artist who followed the thread, or tug, of history to 4 Logan Street. She and Trenholm were house-hunting, and it was that intangible “something”—part gut instinct and part the heady gravitas of time—in the dignified old manse that grabbed them. A gravitas manifest through sloping marble stairs, sturdy stucco, and the deep burnt amber of aged heart pine, not to mention the whispering resonant names of those who once lived here. This grand dame of a house, a three-and-a-half-story Greek Revival/Italianate structure, was built in 1852 by Judge Edward Frost (a respected lawyer, as is Trenholm) and was the former home of a grand dame indeed, another Susan, the stalwart suffragist and pioneering preservationist Susan Pringle Frost, or “Miss Sue,” as she was affectionately known. Frost is regarded as the mother of historic preservation, single-handedly saving scores of Charleston’s crumbling homes when many wanted to replace them with tidier, modern buildings. At the turn of the century, Frost’s sisters taught school in the ground-floor “basement” of the house, now an apartment, and Sue—ever the bold visionary—began holding early meetings of the Charleston Equal Suffrage League in the roomy front parlor. “When I saw the 1915 photo of the National Women’s Party delegation gathered on these front steps, that cinched it. I said, ‘This is it! This is our house. It’s meant to be,’” says the contemporary Susan, a feminist and preserver in her own right, as a curator and weaver of global women’s stories. The home’s distinguished history was complemented by other just-right elements that solidified its appeal. Both Susan and Trenholm were wooed by the ample screened-in porches running the full length of both floors of the main house. “We love that we can open the doors all year long and feel the life of the city out there, hear tourists and carriages go by,” says Susan. “The porches offer an ideal perch, and yet we still feel tucked away.” They appreciate the subtle integrity of the home—its simple grandeur and understated mouldings, the five fireplaces, the large old windows so inviting of sunlight. The fact that the house had been well cared for and the kitchen updated were bonuses, and the spacious double parlors were yet another selling point. 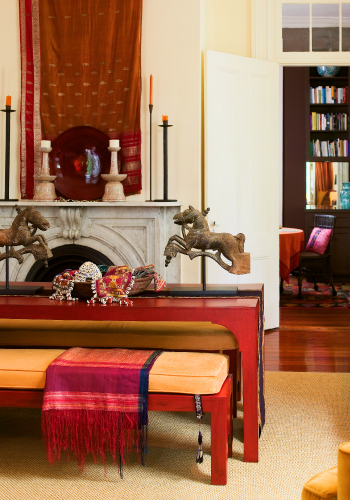 “We were looking for a home that could accommodate the large gatherings we love hosting, whether poetry readings, political conversations, or environmental presentations,” adds Susan, noting that the word “parlor” comes from the French “parlez,” meaning to talk or converse, which is also how “Miss Sue” frequently used these stately rooms. 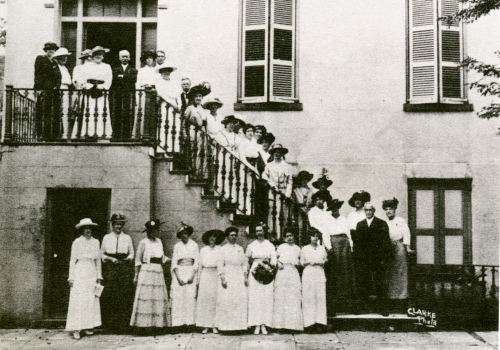 (Another historical thread: in 1917, Sue Frost pushed to get women admitted to the College of Charleston; in 2007, Susan Walker hosted an early gathering of students and supporters of the College’s Women’s and Gender Studies Program.) Living room chairs are on rollers for easy rearranging, and Susan and Trenholm designed the narrow Shaker-esque dining room tables, handcrafted by local woodworker Walter Biffle, to be used in various configurations—as a long banquette, side-by-side as a table for eight, or against the wall to make way for a dance floor. And bring forth she does, as is evident in each room’s many displayed offerings—playful juxtapositions of iconography, art, found objects, and intricately embroidered cloths. 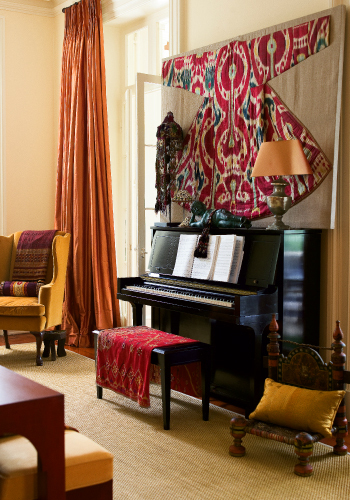 Tabletops become tiny galleries; mantels are humble altars to the gods of beauty, culture, and craft; and almost every piece of furniture is a landing zone for a lush silk throw or exotic sari, draped ever so casually. “I love things that have the hand in them, that have an organic life. 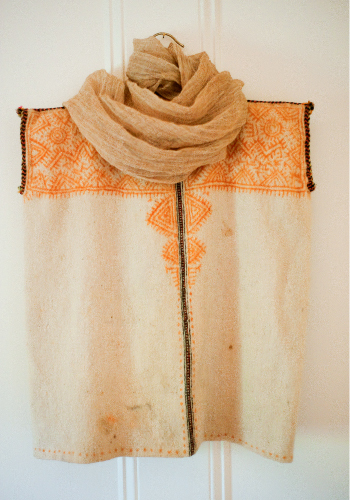 Most of my favorites I found while traveling,” says Susan, a student of textile traditions far and wide, from Morocco to India and Peru, Asia to Africa and Central and South America. “They have a story; they feel genuine and real. 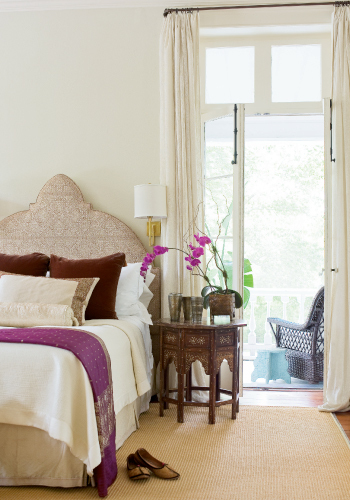 I’ve learned there’s a difference between a room that’s beautiful to look at and a room you step into and feel a sense of life and vitality.” To balance that vitality, the walls, floors, and upholstery are serene and neutral. 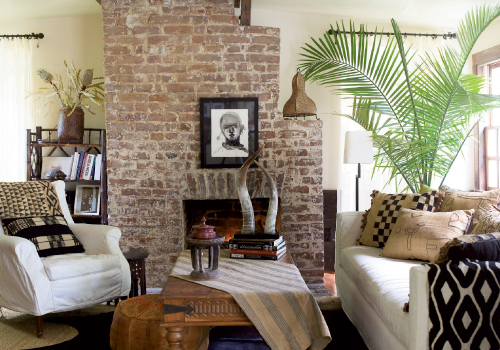 “I couldn’t have all the color and pattern I love. I had to learn restraint,” she admits. 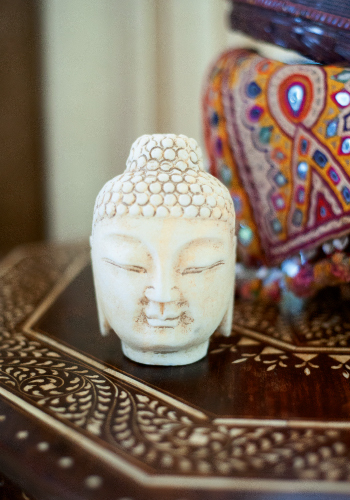 The divine is in the detail, and the hand—and heart—is everywhere in this home. The weathered hand of an Ecuadorian weaver, the patient Turkmenistan hand that sewed thousands of tiny beads on a wedding hat centuries ago, the evocative hands of local artists Kat Hastie and Mary Walker, and the curious hands that dug through piles and piles of old textiles in a dark basement in Morocco, then arranged it all here in a richly layered whimsy. 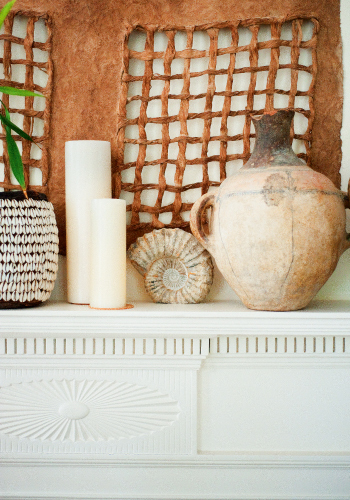 Together, they create a collage of cultures, textures, and handiwork that both comfort and inspire. These rooms are not only lived-in but filled with objects that evoke a life and a history as well. 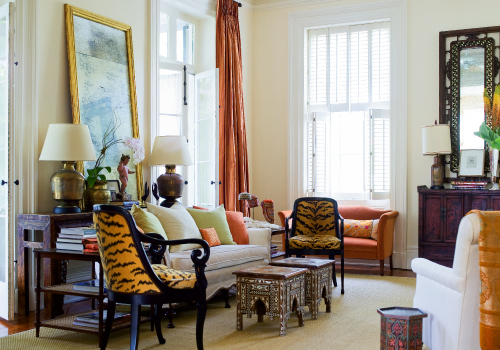 Trenholm, the son of ardent preservationists (his father was a former president of Historic Charleston Foundation), takes great satisfaction in being the steward of this old home, and the intrepid visionary who lived here a century before would undoubtedly be pleased. Miss Sue poured grit and passion into founding the Society for the Preservation of Old Dwelling Places (now the Preservation Society of Charleston), helping to ensure Charleston’s masterfully crafted homes would stand the test of time, that they and their stories might endure to shelter, charm, and inspire future generations. How fitting, then, that her former abode now does just that. If there’s a prevailing “style” at 4 Logan Street today, it’s simply that “lived-in” is essential, that story creates ambiance, and inspiration is always at hand.